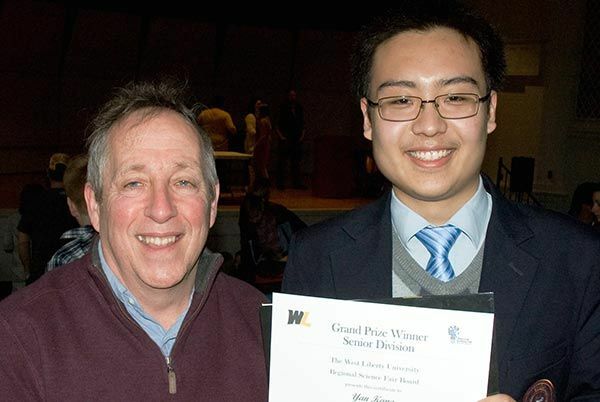 Peter Kang was the Grand Prize Winner in the Senior Division for Best Overall Project at the 2019 West Liberty University Regional Science and Engineering Fair. His project was on Ovipositing Seventeen-Year Cicadas (Magicicada septendecim). Peter also won first place in the Environmental Sciences Senior Division, the Humane Practice in Science Award, and the SMART award at the 2019 West Liberty University Regional Science and Engineering Fair. He is pictured with science instructor Dr. Edinger.